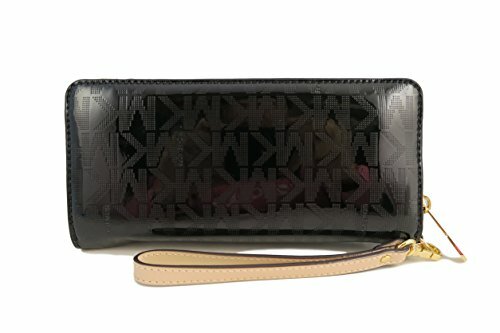 Buy the Michael Kors Wallet Wristlet from Amazon for as low as $72.94!! My daughters both love Michael Kors and both have wallets -thanks to birthdays and Christmas! If you have been looking for a great deal to get a MK wallet, check out the current deal on Amazon! Pay as low as $72.94 for the Michael Kors Wristlet!! There are a total of 4 different colors and the prices vary but 2 are under $75!! These are selling out so don’t wait!! Amazon Prime members get FREE 2-day shipping!! If you are not a Prime member, get FREE shipping when you purchase $25 or more of eligible books or $49 or more of eligible items across any product category. Spacious travel wallet wrapped in high gloss black PVC with Michael Kors 2016 small block lettering and polished gold tone hardware. The front is accented with Michael Kors logo nameplate which has been updated for 2015 with an elevated profile and rounded corners. This zip around style wallet has a saffiano finished leather and signature fabric interior that features (16) card slots, a clear ID slot, (6) full length bill compartments and a zippered coin compartment. It has a removable wristlet strap and measures approximately 8.25″ (L) x 3.75″ (H) x 1.25″ (W). Buy the Michael Kors Wallet Wristlet from Amazon. Previous article4 Whitmor White Wire Storage Cubes only $14.88 (Lowest Price)!! Next articlePetSmart $10 off $30 Deal plus FREE Shipping or In-Store Pickup! !